Easy installation Maximizes storage flexibility Interface: Serial ATA Dimensions: 5" L 5.25" W 0.5" H (12.7mm Thick) In the age of digital downloads, don't let your CD/DVD drive slot go to waste! This SATA optical bay hard drive caddy allows you to replace your CD/DVD drive with a second hard drive or solid state drive, instantly adding more storage space to your laptop. Works with any laptop that has a 12.7mm optical bay. Item is shipped in retail blister packaging with easy to follow, step-by-step instructions for installation. Data Doubler Optical Bay to HDD/SSD Apple Macbook Pro . Condition is Used. I just removed it from a 2011 Macbook Pro that I was upgrading. It includes the HD cable for that laptop (see pictures) but I believe that this unit can be used in a number of different Mac machines. You will need your own cable if it is not a Macbook Pro. Your bid is all you pay because I pay for shipping. Thanks for looking! Dell Precision M4800 M6800. Add this caddy to your laptop to give you another hard drive. This 2nd SATA Hard Drive Adapter lets you add a second hard drive to the laptop systems. 1x Hard Drive Adapter/caddy. For Dell E5400 E5410 E5420 E5500 E5510 E5520. Laptop Hard Drive Cover Caddy. Simply pull out your CD/DVD drive and replace it with our optical bay hard drive caddy. Laptop Keyboard. Swapping the ad-ons and faceplate from your original DVD Drive maybe required. 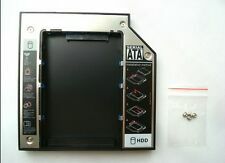 Interface: SATA(ODD)-SATA(HDD). 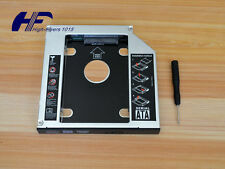 Universal for 9.5 mm hard disk, 2.5" SATA to SATA. 1 x hard drive caddy with flat bezel (with screws). Magnesium aluminum alloy. 12.7mm SATA interface. Material: Magnesium aluminum alloy.